Star Wars fan page by Rob Davis (robd) - Paying tribute to the great Star Wars Movies. The Star Wars™ trilogy is the most successful film series in motion picture history. Combining a timeless story of good versus evil with a compelling cast of characters and groundbreaking effects. Star Wars™ has become a modern day myth and a pop culture phenomenon. This is the reason I have chosen to dedicate a page of my personal website (that's me Rob Davis) to it. 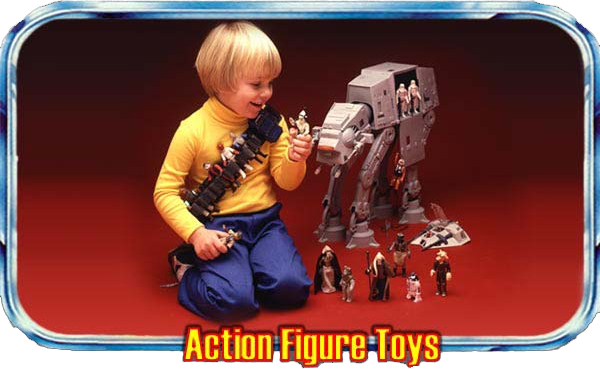 So, as a child all I wanted was the next Star Wars™ action figure. The kid in the image below WAS me, I probably even had the mustard turtle neck and haircut too. Anyway, I obsessively collected them, I meticulously displayed them. I was also really smart and got one to play with and one to keep, so I have all the original figures from the first three (Episodes III, IV and V) movies with the weapons. Cha Ching! I have a few resources on this site that were originally just meant for my use but since I have them, enjoy. I have some Star Wars images you can download. I have a few Star Wars sound files on this site, but I have many, many more at my Star Wars Sound Archive. Oh, and like the big geek I am I scanned in a photo of my tickets to Episode I. Thanks for making it this far. I just wanted to point out that the symbol on the navigation to the left denotes a favorite, must visit site. If you have any suggestions for other links or would like to report a bad link, please contact me.